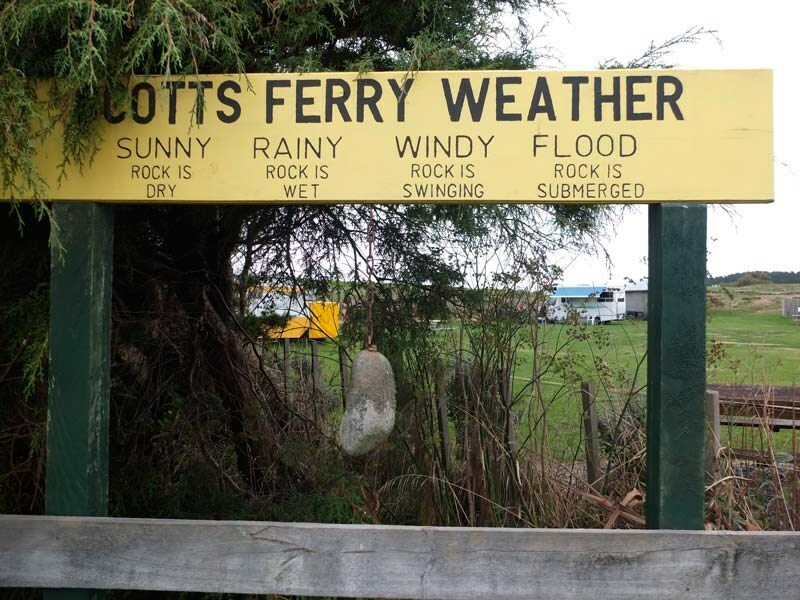 Former Motorhomes Caravans & Destinations editor Jill Malcolm takes the coastal road to Scotts Ferry. The road north from Foxton up SH1 offered little in the way of interest or scenic beauty. The plains stretched away as flat as a Sunday afternoon. Scatterings of wind-buffeted trees leaned away from the sea at such an angle, it sometimes appeared as if the land itself was tilted. By the time we reached Bulls I was in need of a diversion. Prompted by curiosity, I persuaded Bill to turn toward the coast along the route that leads to Scotts Ferry. The name, I thought, held promise. Immediately things became more interesting. The road wound through farmland dotted with willows and divided by hedges. Patches of swampland were peppered with toetoe. The heavy clouds fragmented and revealed a pearly sky. 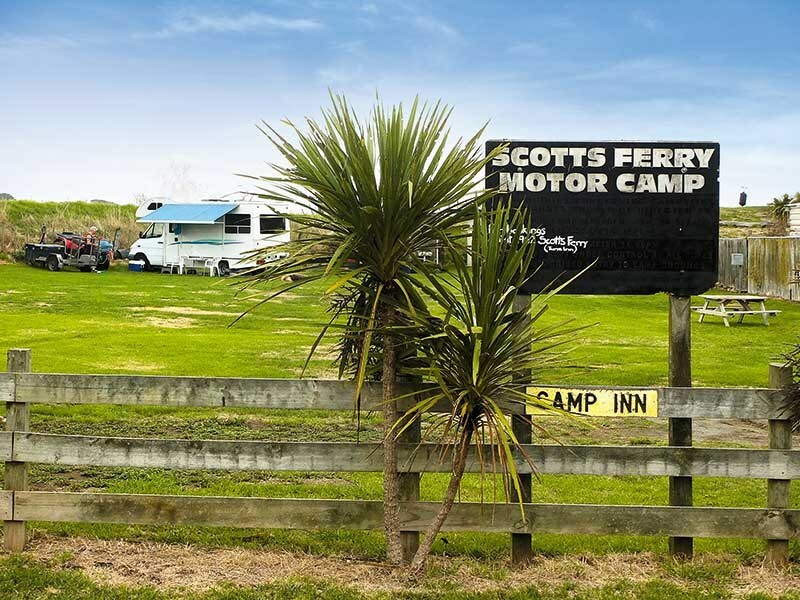 Scotts Ferry is just a row of cottages and a plain, but pleasant-looking, campground jammed against the northern stop bank of the Rangitikei River near its mouth. Just beyond is the end of the road. From there I tried to walk on out to Moara Roa Beach where katipo spiders are said to lurk under the driftwood. I’d liked to have seen one but a reedy lake slung between high sand dunes put paid to that idea. Back in the village was another curious thing. Pinned to every house fence was a sign that ended with ‘inn’ – Tune Inn, Believe Inn, Mucking Inn – and so on. I queried the only human being in sight, a man in an oversized oilskin coat who was fitting fishing gear to the boot of his station wagon. "In Scott’s day there was an inn here," he informed me. "So people thought they’d have a bit of fun with history." The man pointed down the road. "You’d better have a look at the old barge," he said. On the side of the road I found the unprepossessing restored barge that used to ferry travellers across the river when there were no bridges. The service was begun in 1850 by Thomas Scott and, to serve the district, quite a large port began to be developed. Small ships pulled into a wharf and the barge transported cattle, sheep and coachloads of people. The last ship was the steamer Queen of the South, which left the wharf in February 1897 carrying bales of wool. Two months later, a monster flood swept the whole infrastructure away (the settlement was badly flooded again in 2004). In the end I was quite fascinated by this scruffy little place at the end of the road. I guess curiosity has its rewards.